Erin Bradley Designs: Black Friday Sale Starts Now! My Black Friday sale is officially ON! 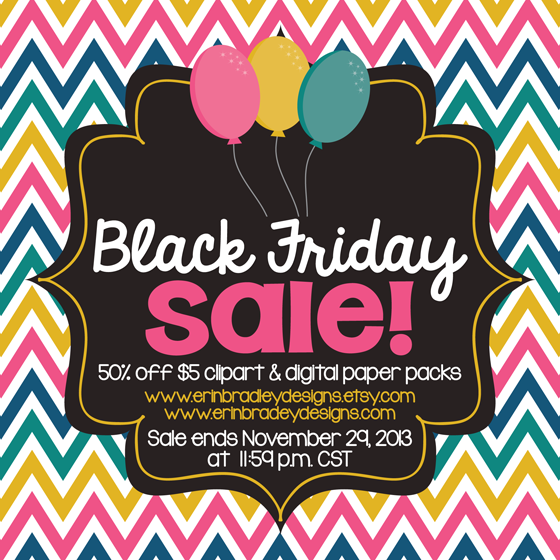 $5 clipart & digital paper packs are 50% off until November 29, 2013 at 11:59p.m. CST. The prices have already been marked down at both www.erinbradleydesigns.com and www.erinbradleydesigns.etsy.com so you can shop at whichever website you would prefer. Never Miss Out...Follow the blog by email! ©2010 Erin Bradley. Powered by Blogger.